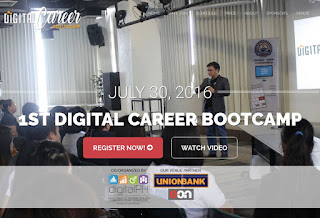 The Department of Information and Communications Technology (DICT) of the Philippines and OnlineJobsUniversity.com (OJU) will be having the 1st Digital Career Bootcamp happening this July 30 from 8 am to 5 pm at Unionbank, 48th floor, Ortigas Center, Pasig City. The Digital Career Bootcamp is a one-day event aims to equip participants with the awareness and up-to-date information on how to get started finding sustainable work online through inspirational talks and lectures with actionable steps. Aspiring and experienced work from home professionals are invited to join and be part of this learning event. To give the keynote talk is the Deputy Executive Director for eInnovation of the Department of Information and Communications (DICT) of the Philippines Mon Ibrahim will give the participants an overview of the state of digital careers in the Philippines and government initiatives. This bootcamp showcases experienced online professionals such as Digital Career coach and founder of Online Jobs University (OJU) Genesis Reonico, OJU Training and Development lead and founder of REA Solutions Rea Yadao, OJU Media and Creatives lead and CEO of SophiesCreatives.com Charlie Aquino. Listen and learn from various experts in the field: 199jobs.com Co-Founder, Registered Financial Planner (RFP) and Blogger Fitz Villafuerte, Founder and CEO Gilmar Padua of Infinity Hub, E-Commerce Specialist and Virtual Assistant Sherlane Fortunado, Social Media Manager Valerie Joy Deveza of Bidsketch, Freelance Customer Support Service Provider CJ Maturino of 'Online Filipino Freelancer' Community, Article/Content Writing Service provider and founder of “Do It Write Solutions” Nizza Gueco will also be featured in the event. Virtual Workforce Professionals' CEO Leif Brian Margallo and Front Line Virtual Services' COO Maritess Pasag will share their respective success stories in creating their own Business Process Outsourcing (BPO) agencies. Attendees will also be given an opportunity to ask questions diretly to them during the open forum in the afternoon. Learn more, access big discounts and buy your tickets for the Digital Career Bootcamp at http://digitalcareerbootcamp.com. Learning investment starts at P1,477 (early bird rate until July 7), inclusive of event pass, lunch and snacks, access to exclusive online mastermind group and event recording, and discount to the upcoming 'Digital Career Online Training Bootcamp'. The Digital Career Bootcamp is done in collaboration with Unionbank (venue partner), Unionbank EON, Infinity Hub, RIS Philippines, SophieCreatives.com, REA Solutions, Bbulletin, and OsipCampus.